Cara came to us in April 11, after being nursed back to health by DAWG as she had suffered terrible neglect and cruelty. 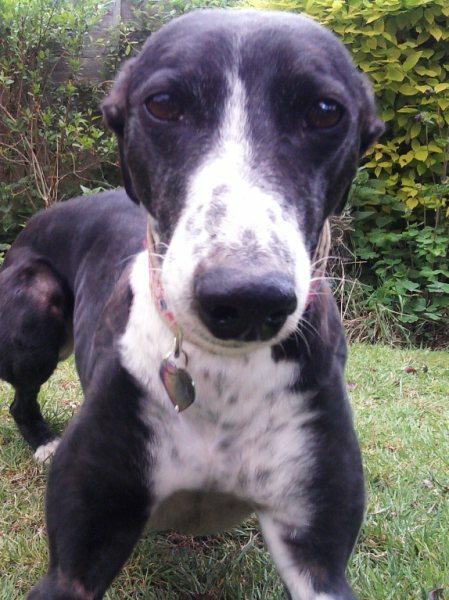 Despite this, she is a lovely gentle girl who loves people, the sofa and cuddles. She gets especially excited at walk times, 'smiling' and charging the other dogs out of the way in order to be first on the lead. Dinner is also a highlight for Cara - even now she cannot seem to believe her regular meals and rushes them down as quickly as possible in case they disappear. She is a lovely dog and we feel lucky to have her as part of our family.